I have always believed that little cities are much more beautiful than the big ones. They portray more accurately the country’s culture and most importantly, they are not crowded with tourists! Because I like so much to take photos, non-crowded places are everything to me! I am not against visiting the big cities, I am just saying that, for example, if you go to Amsterdam for 5 days, I would definitely recommend spending 2 days in other cities nearby. The thing is: after visiting a few capital cities, they all start to look the same. Access to Giethoorn if you don’t have a car can be pretty difficult. You must take several buses and trains to get there. This is why I recommend renting a car for one day. For the car and fuel we paid 90 euros for one day and we were 3 persons. It was a really good deal considering the public transport prices in the Netherlands. Be sure to get up early. The tourist are starting to flood the city around 10.30 am so if you want to get some awesome photos, be there as early as you can. Giethoorn is breathtaking and is well known because it has no roads for cars. It is also called the Venice of the North and for good reasons. For more info about Giethoorn, click here. Haarlem is just 15-20 min away by train from Amsterdam. If you need a little escapade from the city rush, Haarlem is the place to go. The city itself is very quiet and relaxing and you will definitely enjoy its architecture. I recommend getting lost in the city and visiting Grote Kerk, the city center and the Diocese of Haarlem-Amsterdam (see the above pic). What I like the most about people in the Netherlands is that they do not have curtains for their houses and I can admire all their beautiful interiors designed in unique ways. This is available especially for Haarlem where the windows for the first floors are pretty low. I know this might sound creepy but one has to admire what is beautiful, right? Just half an hour by car or one hour by bike away from Amsterdam, there is this cute little town called Muiden. I recommend going by bike as the road is an easy ride and the views are pretty amazing. You will even pass by a beach an your way to the city. 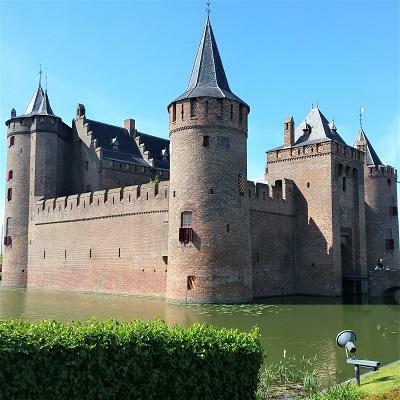 What makes Muiden special is the Muiderslot castle. It can be visited on the inside and it is very well preserved. Muiderslot is definitely on of the most beautiful castles in the Netherlands. Delft is about one hour away by train from Amsterdam. If you want to bring home a little delft pottery souvenir, this is the place to buy it. Also, besides the city’s architecture you can enjoy a bit of art. I recommend the Vermeer Centrum. If you want to enjoy a beautiful panoramic of the city, climb up the stairs of Nieuwe Kerk tower. Another landmark you must see is De Oostport. I will leave a picture below to convince you :). Volendam is all about cute houses and tasty fish. Being a former fisherman settlement, Volendam has a large offering of fish from which you can choose. It is the perfect place for a gourmand. Artist such as Picasso and Renoir have spent time in this city as it used to be some kind of a retreat for artists at the beginning of the 20th century. If your want to try a traditional Dutch look, this is the place to do it! There are many shops where you can rent traditional costumes and snap an awesome shot. I know it is hard to choose between these five cities because each of them has its own charm and beauty but this is a good reason to take more than on trips to the Netherlands, right?